That seems to have happened even faster than Korine and Bivens thought. As soon as filming began, paparazzi images began circulating from the set, a year and a half before the movie’s March 29 release date. 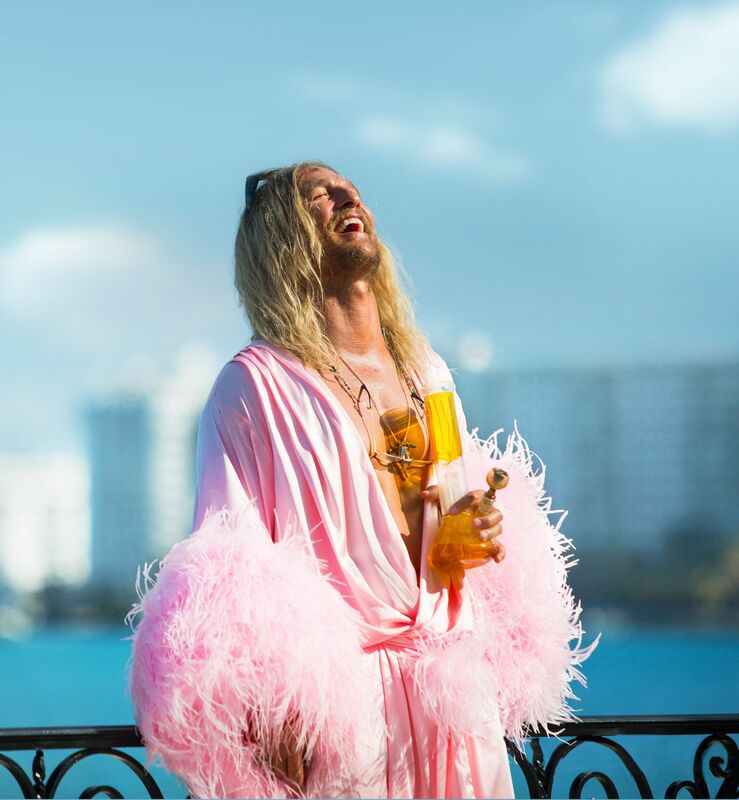 The images went viral: By now you’ve surely seen countless photographs of McConaughey, who plays the wandering Florida stoner Moondog, with his hair a stringy, bleach-blond straggle, wearing a burnt-orange-and-blue palm-tree-print shirt with matching shorts, and white tube socks and Velcro dad sneakers. Or in a grandma’s Florida condo chintz-print blouse and shorts. Or skateboarding in silver Uggs appliqued with purple sequin hearts. Every look was more ridiculous than the last: in mid-December, McConaughey was in a kind of cheesy ’90s mall version of a Memphis Design pattern, riding a hoverboard while eating a lobster with his hands. His shirt was unbuttoned, and he was wearing a lobster bib. It was righteous. Korine has a pretty bizarre conception of celebrity; he doesn’t so much wink as he does look at you, deadpan, and blink slowly. It seemed like McConaughey was playing a caricature of the most extreme version of public persona—“Alright alright alriiiiiiight” but with a wardrobe to express the joyful chaos of his inner life—and Efron was toying with his inherent cheesiness, and Snoop Dogg was...getting paid to play Snoop Dogg, the ultimate Snoop Dogg finesse. The film’s costumes, and the moments that seemed to erupt in tandem with their exuberance, were so extreme, so potent, that if the film never came out, we’d still have felt its influence. And then a weird thing started happening. Uggs came back into style. Prada showed a flame-print suit last summer. Footwear News wrote that Justin Bieber appeared at Coachella “dressed up like Matthew McConaughey’s character in the actor’s upcoming film, The Beach Bum,” and in June, Vanity Fair anointed Bieber and Jonah Hill and Pete Davidson as kings of “scumbro” style—“the R.E.I.-clad trustafarian co-ed meets Supreme. It’s pizza for breakfast and caviar pizza for dinner.” The film hasn’t even been released yet, but its fingerprints are all over fashion already. How did Bivens and Korine tap into the unlikely way that a ton of guys are dressing before this movie has even come out yet? As the film continues, Moondog runs through some of his luck. “That's, in a way, one of the biggest tensions in the film, letting all this bad stuff happen to him,” while maintaining his good vibes. Korine takes over Moondog’s typewriter. It isn’t that Bivens is some kind of sleazecore whisperer; by all appearances, she seems to be a cool blonde who wears a lot of black clothing by The Row and Christopher Kane. Instead, Bivens shares Korine’s bizarre Gen X vibe: an obsession with subculture and brands and ideas and people the mainstream might overlook or discount, whether that’s Uggs or Disney stars. But The Beach Bum isn’t the first time she’s filtered those interests into film. Bivens, who is 42, started her career working in magazines, styling for W, Purple, and Vogue, and has worked as a costume designer since the early 2000s—she’s styled music videos for Kanye West and Beck, for example, and did costumes for David Lynch’s Inland Empire (2006), and that great Spike Jonze Kenzo perfume ad from 2016 in which Margaret Quallay dances like a maniac, and short fashion films directed by the likes of Tim Barber, Cass Bird, and Daphne Guinness. More recently, her approach has bled into—or straight-up helped inspire—the current ’90s revival. In addition to Korine’s upcoming film, Bivens also worked last year as the costume designer for Jonah Hill’s directorial debut Mid90s. “I hired Heidi three years before we even started shooting,” Hill told GQ around the time of the film’s release. “I knew very early on who I wanted to do costumes.” In other words, she’s sort of a legend in that universe. For that film, she scoured her stash of contemporaneous skate magazines and recreated graphic T-shirts by brands like Blind and Chocolate; she even called in Spike Jonze to look at a screen test to make sure the baggy fit of the jeans was just right. Jonze is a telling reference: Bivens has that Gen X energy, though hers leans distinctly more toward that era’s cool girls. She has the same “girls have to stick together” outlook, protective without mothering, that helped make Kim Gordon, Natasha Lyonne, and Chloe Sevigny icons. That led her to Korine, who she’d never actually met despite moving in the same skateboarding, fashion, and art circles throughout the ’90s. “We have a lot of mutual friends in common, like more than I can count, but I just never knew him when he was in New York,” she said. So when Spring Breakers was moving into production, she asked her then-agent set up a meeting, for which she went down to see Korine in Nashville. (He now lives in Florida.) “And I think it was clear to him from the start that we could have a shorthand,” Bivens said. But something feels different this time around. I told her that, while lots of people are thinking about The Beach Bum as Korine’s magnum opus—his most fully realized and coherent film—it feels like her magnum opus, too. Something about the insane coherence of its chaotic look feels inevitable, like Korine and Bivens have been waiting to articulate this for a long time. As she did in Mid90s, for example, she called on her long term brain trust for The Beach Bum. Efron’s vest, for example, is a piece Bivens made in collaboration with New York artist Chris Habib, another friend and fan of both Korine and Bivens. “I told him about Zac’s character—that he was sort of a nihilist, but also a Jesus freak. And he just took the ball and ran with it.” The patches are earnestly boneheaded, and therefore hilarious: “These ARE my church clothes,” reads one. Or when Korine told Bivens that McConaughey should look like he was on fire. “I don’t even think he was specifically thinking of literal flames—we ended up using this photorealistic print of flames—but he just wanted to convey visually that he was on fire,” Bivens said. “I just wanted to make it ridiculous and over the top. Because we were really going for comedy. That was stressed throughout the visual direction: if we had a choice, go for comedy.” Good fashion is so serious; doesn’t it feel good to be able to laugh at it for once? “But I like to think that there is a creative ether that exists, and we’re all influenced by stuff even when we don’t realize it, even if we’re not conscious of it.” As for whether the film’s release will mean even more guys dressing a la McConaughey and Snoop, Bivens said, “We’ll see what happens this summer. I think it’s fun because it’s not taking itself too seriously. And I’m happy to see that, just because it feels refreshing.” Catch you guys on my hoverboard.